When selling tickets to an event, it’s extremely important to make the ticket purchasing process as easy as possible for your patrons. No matter how many photos and event details our team adds to your event page on TicketAlternative.com, customers are less likely to buy tickets if you do not properly direct them to the point of purchase on your event website. Integrating our branding into your website, social media, and advertising assures patrons that they can safely purchase tickets through Ticket Alternative and it allows for a simpler purchasing process. The easier you make it for your customers to purchase tickets, the more likely they are to buy. • Links – Instead of saying “Tickets available at TicketAlternative.com”, link directly to your event on Ticket Alternative so that your customers don’t have to search for the event. The more clicks it takes for customers to find an event, the less likely they are to purchase tickets. 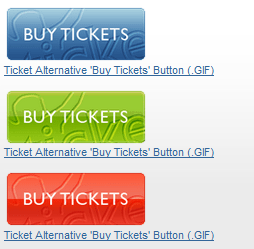 • Buttons – We have an assortment of “BUY TICKETS” buttons available here that you can use on your site. If you have a calendar page on your website that lists all of your events, this is a great tool for linking directly to each event. Our buttons are bright and easy to see, which easily directs customers to purchasing tickets. • Phone number – There’s more than one way to buy tickets from us, and we want to make sure your customers know! They can always call us at 877-725-8849 if they prefer to purchase tickets by phone or if they have any questions. • Outlets – We have 13 Atlanta area outlets located in Whole Foods Markets and local record stores like Criminal Records, Decatur CD, and CD Warehouse. This is a great option for customers who prefer to pay cash when purchasing their tickets. We’re always available if you ever have any questions about how to best integrate ticketing links into your marketing. Please reach out and we’ll be happy to give you a hand. Email our Marketing Coordinator Katie Caccavale at Katie.Caccavale@TicketAlternative.com or give us a call at 678-701-6112.